As a big traveler and "organization-obsessed crazy person" (as others would have it), I wanted to be efficient with the sights I'm seeing and where I'm eating when setting off for new places. There's little worse than walking back and forth around the city wasting time or accidentally booking a hotel miles away from the rest of my itinerary! Oddly enough, the best tool I've found to streamline vacation planning is Google My Maps. I use it to pin key places, color code my points of interest, and then make hotel booking decisions based on pin density. This seems to be a little known feature and is actually really hard to get to from other Google products so I wanted to share the wealth. Open Google My Maps and create a new map. Find places to visit and things to do! I usually go through TripAdvisor for the top 10 sightseeing attractions, then visit a few food blogs or browse Instagram foodie feeds for the best places to eat. 4. See how there are a few highly-concentrated areas where all of our pins landed? Then I find and book a hotel near the clustered areas using a booking engine like Expedia or Booking.com (whose map views make it easy to compare them side by side). 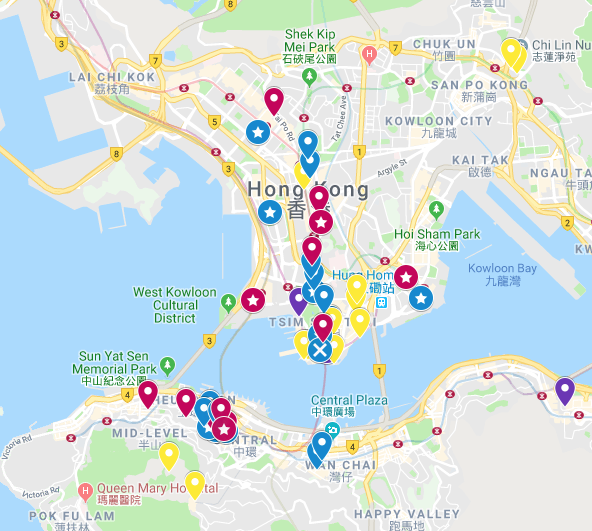 This helped me decide on a hotel near Tsim Tsa Tsui station, where a lot of the yellow (attraction) pins were. This was perfect because we could use Hong Kong’s fantastic public transportation to get around to all the other pins! The best part about this is when I go out to sightsee, I can organize my days around neighborhoods with the most attractions and then walk around in any order I want because they are all clustered together. When I get hungry, I can check out whatever blue pins (restaurants) are nearest me for optimal efficiency!